Home > Ask Our Experts > How to Make a Camp Community Safe for Children? What would be the most important elements in making a camp community safe, caring and moral for children? Camp life should provide a safe community for all children of all ages. 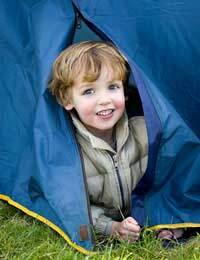 A camp community also allows your children to freely explore a variety of activities and values independently. However, in order to do this they must feel safe in their environment and with other children and adults. Being part of a community allows children to explore many key values. These include acceptance, regardless of gender or age; responsibility to themselves and others; creativity and the freedom of choice. Being able to share experiences with new people will also encourage children to become more independent. Safety and security are important. When you first arrive at the site make sure you take the time to make an inspection of the area and facilities available. If you have any questions or concerns regarding safety and/or security make sure these are answered to your satisfaction. If you feel comfortable in the surroundings your children are most likely to feel comfortable too. Explain to your child that it is important they familiarise themselves with the camp community, so that it is easy for them to get their bearings at all times. Ensuring children are also aware of the community rules and regulations is also important. It is important that you explain to children, in a way that they can understand, how they can take preventative measures that minimise potential dangers and harm. This includes trusting their gut feelings about people and places and limiting situations that may present problems. Also explain what is allowed and what is strictly off limits. The laying of ground rules should be explained to children, so that they are able to understand the importance of the restrictions you may set. It is also important that you know where your children are at all times, so ensuring they understand your reasons for this will enable them to readily comply with your rules. Encourage children to get involved in the planning of activities. Being part of a friendly community is a pleasurable experience for everyone. Having a good selection of activities to enjoy will also ensure children can explore their camp community fully.